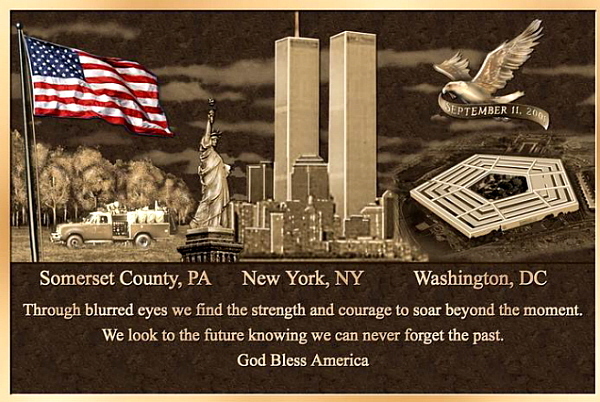 We will remember for the rest of our lives what we were doing Sept 11, 2001. That was the day that America changed forever. I was at home with my husband, who had recently broken his ankle at work. His friend called from North Carolina to tell us that an airplane had just hit the World Trade Center. My husband thought he was just making things up or something. I remember him repeating himself, "Are you serious? Are you sure? You're serious?" We turned on the news a couple minutes before the second plane hit the second tower. Staring at our TV in disbelief, we didn't speak to each other at all. We just watched and listened in shock. Then the reports started coming in about the Pentagon and the Pennsylvania crash. Not long after that day, my husband was put on orders with his unit and life as we know it continues. Ten years later, we are still shocked by footage of that day. Ten years later, we are still in an ongoing war to keep America safe from the terrorists who hate our country. Last night I couldn't sleep and I was watching one show after the next dedicated to 9/11. I was so emotional! The people who sacrificed themselves to make sure others were safe. They kept playing phone messages that were left to loved ones when they realized their end was near. The ones that hurt the most were the ones who thought they were fine and everything was going to be OK. They had no idea what was happening around them. My prayers are with those who lost loved ones on that horrific day. A big thank you goes out to all our First Responders (Fire, Police, EMTs) and our military. My church had a really nice service today. We honored Tucson's 1st responders with an offering so they could get things they needed to continue to protect and serve. Today, enjoy your family. Hug your loved ones. What a lovely piece! It was a horrible day, so many lives sacrificed that day and beyond, the people that have gotten sick in the recovery and clean up, and of course the men and women and thier famlies who have fought and continue to fight the two wars that this awful event made possible. My thoughts and prayers are with you and your husband, and thank you for your sacrifice. I'm so glad I found your though voiceBoks and am now following your site. Thank you Kathy! I read your post about that day and it gave me chills. You and your family were so close to it all. I can only imagine how you all felt with this happening in your backyard. I'm so glad your family and close friends made it out OK. I live so far from it and still feel shivers. My heart goes out to all who lost innocent people. Great to meet you through voiceboks! Have a great week! Hi- Visiting from VB, Members to Remember. What a great tribute to all of the fallen heros from that day. Ten years later and I agree, it's still so devastating. Our church did an amazing service to remember too. Glad to hear that so many around our country took time out to lift up all who were affected. Thank you for posting and for highlighting the ones who were lost on that tragic day!